This entry was posted on February 20, 2015 by Tinteán Editorial Team/EMcK, in Of Literary Interest, Theatre Notice, What's On... and tagged Adelaide Festival, Beckett, drama, entertainment, Irish Literature. Bookmark the permalink. 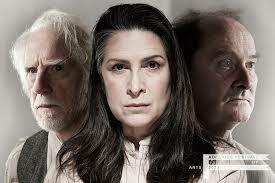 Paul Blackwell, Peter Carroll and Pamela Rabe in three perfect theatrical gems: Footfalls, Eh Joe and Krapp’s Last Tape. State Theatre Company, Scenic Workshop and Rehearsal Room, King William Road, Adelaide.